In my childhood days, I used to play this game, "I Spy, With My Little Eye... something starting with the letter ..." on long car journeys that my family used to take down peninsula Malaysia, starting from my hometown in Penang, and reaching Johor Bahru and Singapore. It's just a little game of observation and quizzes to pass the time on the long trip down south. The eye is a powerful organ in the animal world. It allows us to see and understand, recognise and react to the world around us. It is no different amongst invertebrates like butterflies. Unlike vertebrates, which are equipped with the single-lens eye, most invertebrates - crustaceans and insects - have compound eyes. 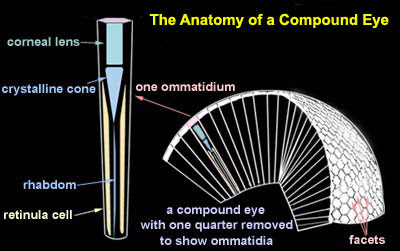 A compound eye is made up of many separate units called ommatidia (singular: ommatidium). Each unit has its own surface area, lens, and optic nerve fiber. It receives light from a small part of the animals field of view. The animal's brain integrates these views into a single image. Compound eyes are made up of many divisions, giving the eye a net or mesh like appearance. It is this multitude of divisions that gives it the name: Compound Eye. 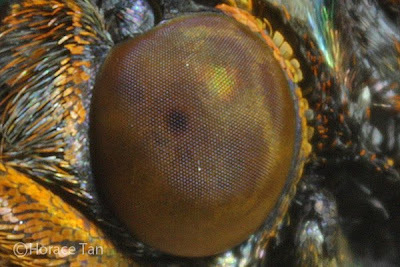 An insect's compound eyes usually bulge out and have a wide field of view. 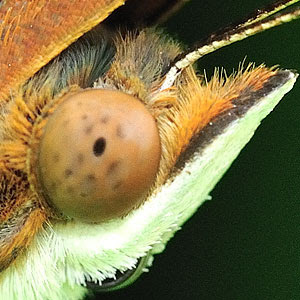 The lenses in compound eyes can't change focus, so insects can't see things that are far away. 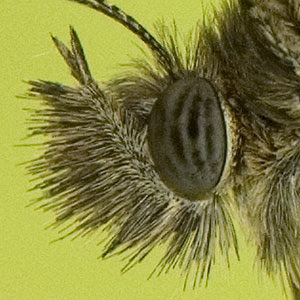 However, most things that concern an insect are up close and personal. The compound eye is very good at seeing things nearby and detecting motion. Butterflies rely on colour to find food from flowers, and they have colour vision that is more enhanced than our own. 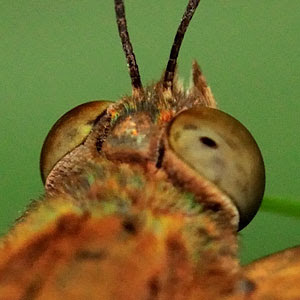 A butterfly's vision is quite sharp at close quarters, but because acuity depends on the number of facets aimed at the object, butterflies are very near-sighted. 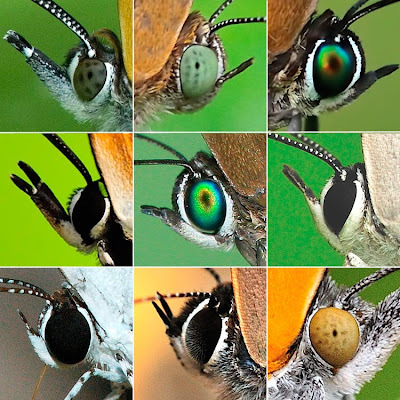 Their colour vision has been experimentally proven, and in addition to all the wavelengths that we humans can see, butterflies can see far into the ultraviolet (UV) as well as infrared (IR).They use ultraviolet (UV) light to perceive patterns on nectar-laden flowers that are invisible to us, and they perceive the colours of flowers differently from human beings. Recent research also suggests that colour sensitivity varies across different groups and species, and eventually this may offer some explanation for the behavioural differences observed between species. Over many years of photographing butterflies, I have observed that the eyes of butterflies across different families and genera are rather distinctive. 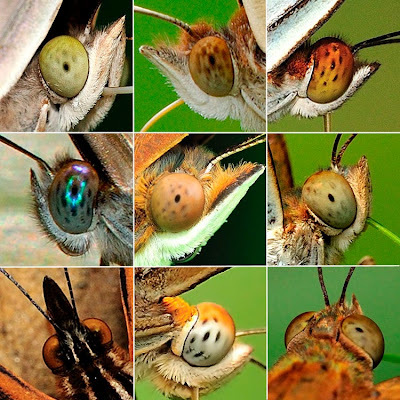 The shots below are a collation of the butterflies of different families. Firstly for the Papilionidae, most, if not all, of the species have opaque jet-black eyes. The eyes are large and are totally black and featureless. The next family, Pieridae, tend to have eyes that are more typical of compound eyes, with checker-board patterns in the eyes. 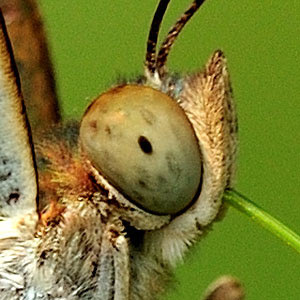 The colour of the eyes is usually similar to the colour of the butterflies' general colour - typically whites or yellows. The next family, Nymphalidae, is rather varied, having a total of nine sub-families of rather distinctive characteristics within the sub-families. The group shown below shows a combination of Satyrinae and Morphinae. 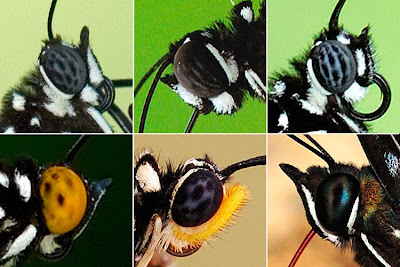 The Satyrinae have striped compound eye structure, giving their predominantly grey eyes a banded appearance. The Morphinae are more varied, but one genus, Faunis, has a nice deep jade-green eyes. The next subfamilies, Danainae, Heliconiinae and Apaturinae, shown below, have striped and chequered appearance. but some with rather vivid colours of yellows and greens. The remaining Nymphalidae, featuring the families of Nymphalinae, Cyrestinae, Charaxinae, Limetidinidae, also show a variety of chequer-board and spotted appearances, and in many cases, where a larger distinct spot is displayed in some species. The Neptis also have a bluish-green sheen in their compound eyes. Several species of the family Riodinidae feature emerald green eyes, whilst others have reddish brown eyes. Also, the sub-family Miletinae, which also sport striped compound eyes, have yellow-green eyes which appear almost iridescent in the field. 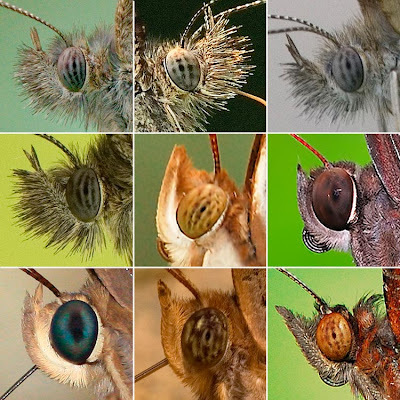 The final family, the Hesperiidae, or Skippers feature extra large eyes, probably needed due to the butterflies' crepuscular (or flying in the early hours of dawn and the late hours during dusk) habits. 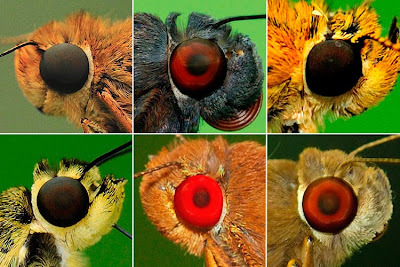 Probably needing more light when flying at tremendous speeds during hours of low light, the Hesperiidae have, by far, the largest eyes amongst all the butterfly families. Several species feature scarlet or dark red eyes, with a darker centre within the compound eye. 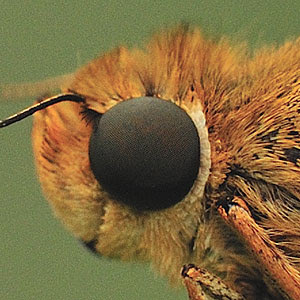 But most Skippers have dark brown and cleanly spherical eyes set in a rather large head of the majority of the Hesperiiidae. So there you have it - even the eyes of our flying jewels are so varied and beautiful when we view them up close and personal to admire Mother Nature's works of art.